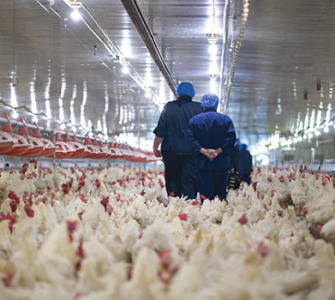 While the all-or-nothing debate about the use of antibiotics in commercial poultry continues, Mountaire Farms is standing on solid middle ground. “The middle would be a certified responsible use or judicious use guideline for antibiotics that addresses antimicrobial resistance and also provides for poultry health and welfare,” Don Ritter, DVM, director of health services for Mountaire, told Poultry Health Today. “Occasionally, chickens get sick and they’re going to need to be treated,” he said, noting that without treatment, poultry welfare can suffer. After treatment, chickens are just as wholesome and healthy to eat as chickens that required not treatment. The goal is to keep the birds healthy in the first place and reduce the antimicrobial resistance risk for people — and that’s where “certified” guidelines come into play. A program with clear guidelines already exists and is audited by USDA’s American Marketing Service (AMS): Certified Responsible Antibiotic Use (CRAU). It’s in use for institutional purchases, and can be modified into a retail-friendly label that would be easily understood by most consumers, Ritter said. The CRAU program began with School Food Focus, a non-profit group that developed guidelines for a local, sustainable, safer food supply for school lunch programs. As the guidelines were developed, it became apparent “no antibiotic ever” meat was too expensive, yet CRAU didn’t want to advocate widespread use of medically important antibiotics in food animals, he explained. The result is a very solid middle-ground program that takes care of the risk to people and still addresses poultry welfare concerns in no-antibiotic-ever systems, Ritter said. If major retailers adopt this standard, it will go a long way to educating consumers. The cost difference should be minimal for establishing a CRAU type standard, he said.